Oh dear. The decline of the Marx Brothers began here with this sagging, sluggish hotel farce made while out on loan to RKO immediately after the death of MGM's Irving Thalberg, their only outing not based on a concept created by the boys themselves. Adapted instead from a 1937 Broadway play by Allen Boretz and John Murray that Zeppo had seen and liked, Room Service finds Groucho's scheming producer in debt and unable to bankroll his latest venture, spending his days fending off the fastidious hotel manager trying to evict him while desperately courting backers for his project. Veteran gag writer Morrie Ryskind does his best with the script but the lines are hit-and-miss, William A. Seiter's direction is utterly anonymous and the one-set approach feels too confined and claustrophobic (in fairness to Ryskind though, his hands were tied by a studio reluctant to alter a hit play and he did later concede that Room Service, "was a cramped, badly paced miscalculation"). Groucho seems particularly uninspired and was clearly only doing it for the money - any Marx caper in which his character is named "Gordon Miller", rather than Dr Hugo Z. Hackenbush, Wolf J. Flywheel, Professor Quincy Adams Wagstaff or Otis P. Driftwood, just can't be good. Future noir character actor Donald MacBride plays the increasingly frustrated hotel boss with gusto ("Jumpin' butterballs!") but Lucille Ball, Ann Miller and, most bizarrely, Chico, are left with very little to do, though the latter does have a nice bit of business with a mounted moose head. Harpo comes off better in a part shoe-horned in especially for him, notably producing a wild turkey from his infinite overcoat and chasing it around the suite with an axe and shotgun in a bid to fend off hunger. His costume for the performance, which features a miner's helmet with a flaming gas lamp affixed to the front, is also at least memorable. Hail and farewell boys. 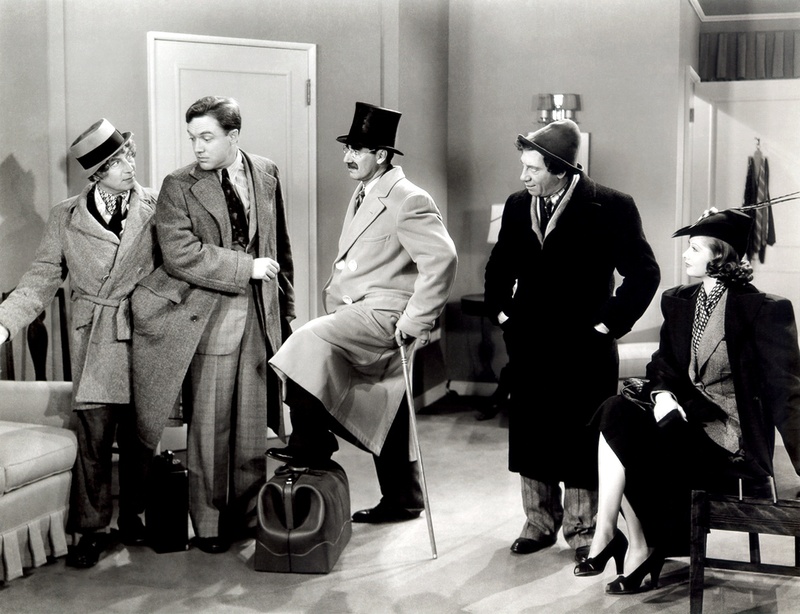 As you point out, 'Room Service' is not of the Marx Bros' best, but I admit to a lingering fondness for it. It was the first Marx Bros film I ever saw, and I do remember taking delight in some of its more bizarre antics; Harpo chasing the flying turkey is a highlight. I also enjoyed Harpo's protracted death agonies in the last part of the picture, as well as Donald MacBride's baffled blustering. If I had to choose between lesser Marx and no Marx, I'll take lesser Marx every time! I think you are absolutely right sir - even lesser Marx has its charms. I guess I was disappointed by Room Service having only recently seen Monkey Business but then that's a tough act for anyone to follow. Harpo used to unnerve me somewhat when I was a kid but the older I get the more I love him and he struck me as being on particularly fine form here.